Prior to 1963, the district was served by the Avonhead Primary School which, due to the growth of new housing estates, had become overloaded. A new school, "Cutts Road" School, was therefore proposed to be built. Being a semi-rural area, this was envisaged as a small school with under a hundred pupils. Mr David Stewart was appointed headmaster in October 1962, before building had even commenced. The first buildings of the new school were not ready for occupation until the end of May 1963, and in the meantime the "Cutts Road School" had officially opened at the beginning of the year with 134 pupils, operating as a "school within a school" at Avonhead. At the beginning of the second term, Monday 27th May 1963, the staff and 174 pupils moved into the new premises. A Public meeting was held in the Masham Church on 2nd April 1963 for the purpose of forming a School Committee for the administraion of the school. An important item on the agenda was to decide on a suitable name for the school. Names suggested for the new school were Masham, Russley, Pinehurst, Woodbury and Cutts Road. 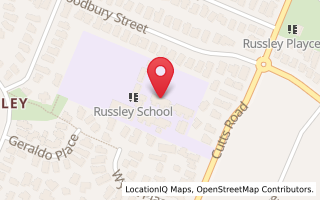 A vote was taken and the name 'Russley School' was chosen. Far from being a small semi-rural school, Russley soon became surrounded by more and more, bigger and better housing estates. By December 1966, the school was so pressed for space that classes had to be held at St Stephens Sunday School in Yaldhurst Road, until new buildings were completed. October-December 1971 saw the highest number of pupils at 596! Since then numbers have fluctuated to being in the 300's in the 80's with 12 classrooms, to being in the 400's of the present day with 17 classrooms.